History has been made today on The Teacup of Style. This is the first time ever that a hat (yes, a hat) has made an appearance on my blog! Even though that may not be that exciting for you, it is pretty darn exciting for me. I have been on a hat hunt for literally forever. For some odd reason, I wasn't ever able to find a hat that looked good on me. Maybe you could blame my large forehead. But, I love the look of this hat! It is the perfect size--not too big, and not too small. Do you want to hear the best part? It sits at a pretty price point of under $30! I'm also flat-out obsessed with these pretty lace-up sandals. They're available in a ton of colors, but I adore these brown beauties. 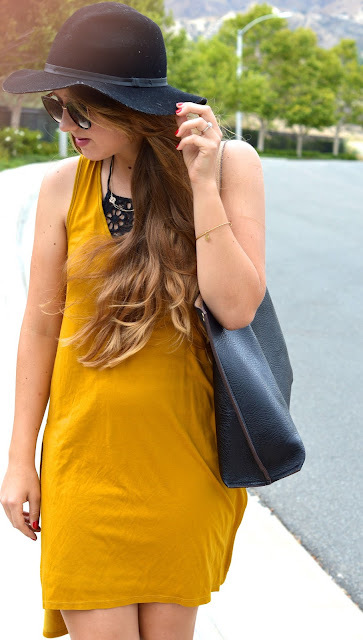 They pair so easily with so many different looks, especially this mustard yellow tunic! This color is great on you! I've been meaning to purchase something in the same shade! Thank you Alexandra! :) It's such a cute and fun shade! Thank you Edye! :) The hat was definitely a great find! !